Playing and teaching the harp for the love of it is what award winning harpist, Virginia Schweninger, does, and her music shows it. Providing inspiration and opportunity to her students is a great passion for Virginia. For 9 years she was Adjunct Harp Instructor at Sweet Briar College and Lynchburg College and continues to have a busy studio at the Music Emporium in Charlottesville and in Nelson County. Virginia volunteers with her harp for the Music by the Bedside program at Hospice of the Piedmont in Charlottesville, VA. Audiences comment that her romantic harp music seems to set just the right ambiance for so many treasured events. As a freelance harpist Virginia's work has included stints with major entertainers, orchestras, choirs and, often has her playing for weddings and private events. She has a very relaxed and joyful approach to both playing and teaching the harp sharing her eclectic style, including contemporary favorites, Broadway and film music as well as classical and Celtic pieces. 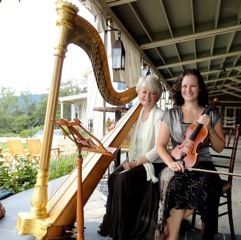 Virginia has been playing her harp for brunch most Sundays for fifteen years now at the charming Nellysford cafe and wine shop, Basic Necessities, not far from the Nelson County mountain resort, Wintergreen.